I had hoped to take Cody to see Billy Elliot, alas cheapish tickets were sold out. 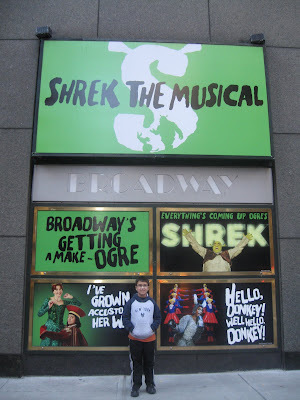 So, we used www.broadwaybox.com discount for Shrek and further saved on fees by purchasing the tickets in person at the Broadway Theatre Box Office. I'll be curious to see what both you and Cody think!! Sarah, I've been following your fun-filled adventures with Cody all week and now have a proposal for you: when he grows up, I'd like you to consider adopting me. What a wonderful aunt you are!